This class was so much fun, we are doing it again! Bring your BFF (Best Friend Forever) and have even more fun! Just three yards of three different fabrics will make a lap sized quilt top. 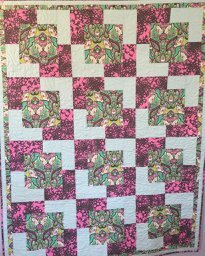 You choose the 3 yard fabric bundle, 3 yard pattern and by the end of the day you will have a completed quilt top. Lunch is also included! Price includes 3 yards or fabric, pattern, and lunch!